Summer readers at Morristown Centennial Library reenact the cover of the book 'The Scandalous Sisterhood of Prickwillow Place'. The first thing readers notice about the finishing school students is that they each have a moniker they can’t seem to shake: Dear Roberta Pratley, Disgraceful Mary Jane Marshall, Dull Martha Boyle, Stout Alice Brooks, Smooth Kitty Heaton, Pocked Louise Dudley and Dour Elinor Siever. Summer readers at the public library in Morristown read The Scandalous Sisterhood of Prickwillow Place. We visited them to discuss the book, and recorded their questions for the author, Julie Berry. We start with eleven year old Rileigh Hughes, who wanted to know about all those nicknames. Rileigh Hughes: When you were coming up with the names for the characters, what inspired you to choose those names? Julie Berry: You know, that’s a great question and the answer’s a funny one. The names that appeared in the very beginning, Disgraceful Mary Jane, Smooth Kitty, they just came to me. I wasn’t planning to do that. It just happened. But then as soon as it had happened I sat back and looked at it and thought, you know seven girls is a lot to keep track of and a little label might help the readers keep them separate in their minds. Chandler Follensbee: How come the characters’ titles don’t change throughout the book, even though their personalities change? Julie Berry: That is an excellent question. I think there are some times when the labels that are used to describe them are challenged a little bit, especially as the story progresses. But the funny thing about names and nicknames is they do tend to stick. Sometimes it seems like your reputation in a group is a hard thing to let go of. And if you’re thought of as the one who’s bossy, you might always be thought of as the one who’s bossy, even after you stop being bossy. And so that’s why I think the names stayed the same even after the girls grew and evolved. 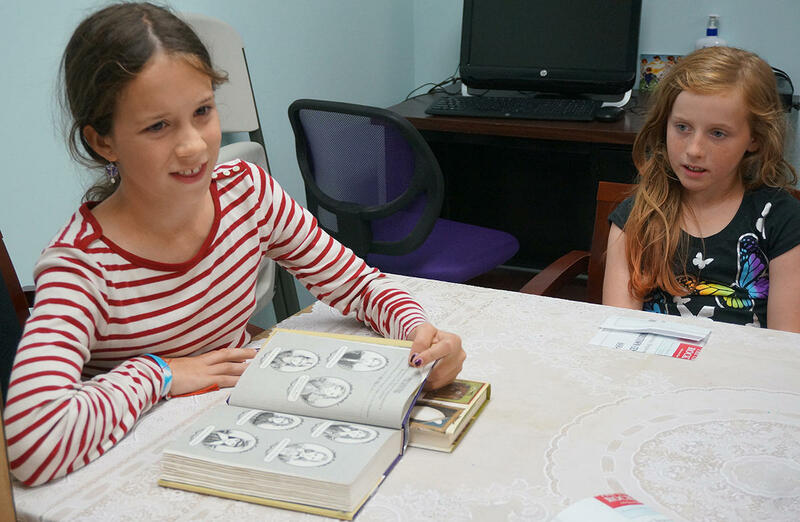 Lila Hancock (left) and Meagan Hughes check out portraits of each character at the front of the book. Lila Hancock: I was wondering if any of the characters in the book were ever based off anyone you know, you, or where you got the ideas for your characters. Julie Berry: In a way, I think there’s a little bit of me in each of the girls. I think each girl represents a different aspect of how I have seen myself or how I see myself. But, on another level, they really are just the characters that bubble up in the creative process. I don’t usually base characters after other people that I know. I’m not sure why that is except that, in my mind, the people in my life are totally different creatures from the people in my stories. It’s like they’re made of different stuff. You know, the people in my life are made of flesh and bones and laughter and good times and the people in my stories are made up of words and dreams and imagination. So, they’re kind of like two different species that don’t cross, if that makes sense. Morristown Children’s Librarian Rachel Booher: Were there any points in this book that you got freaked out or scared when you were writing because of all the mysterious deaths? Julie Berry: Oh, that’s a great question. You know, I don’t think I did because I am sort of the “man behind the curtain” if you think of the Wizard of Oz and the movie. Because I’m the man behind the curtain sort of pulling the lever and making things happen, I’m not as affected by the story as people who are reading it are. That doesn’t mean I don’t love it and enjoy it. But it doesn’t scare me in the way I hope it makes the reader feel a little unnerved. Meagan Hughes: Why did you choose for the setting to be in England, back in the 1800s and what inspired you to have it be a boarding school? Julie Berry: Well, I have always secretly wished that I were a boarding school girl in England. I grew up reading so many books that took place in England that for me, especially the Victorian era, the mid- to late-nineteenth century; it really feels like a magical world where stories are possible. And so I just have always loved the literature that came out of that place and time and I was eager to see if I could write something that felt like it belonged there. Eleven-year-old Saije Simmons takes a close look at the book cover. Saije Simmons: Is there going to be a sequel coming? Julie Berry: I would love for there to be a sequel for this book. As of right now we don’t have one in the works, but I’d love to hear from readers who would like to know more about what happens to this scandalous sisterhood. I am certain that they continue to get into scrapes and possibly even solve crimes. So I hope that we’ll have the chance to follow them on another adventure. I think they should take a trip somewhere. Maybe to a castle. Until these young maidens find their castle, middle school readers can delight in the farcical murder mystery that is The Scandalous Sisterhood of Prickwillow Place. Next month on Dorothy's List, Under the Egg by Laura Marx Fitzgerald. Dorothy's List is supported by the VPR Journalism Fund.